2019 What is urea and why does it work amazing on cracked skin? Urea helps with hydrating the skin so well and is perfect for your cracked heels. So what is urea? First, let’s explain what cracked heels are. Cracked heels are also called heel fissures. They can range from a cosmetic issue to a painful problem, depending on its severity. Heel fissures or cracked heels occur when the skin on outer edge or bottom of heel become hard, flaky and dry. The urea contained in urea cream is created synthetically in labs from ingredients such as ammonia and carbon dioxide. The preparations come in several forms and strengths. These can include cream, lotion, shampoo, gel and shower/bath washes. Strengths of urea products range from 3-40%. The form and strength chosen depend on the condition that is being treated and the severity of the condition. Get a Free Foot Soak recipe HERE! First, visit your family doctor for a recommendation on what type of product you should use. If they tell you to purchase something at the drug store or online you should still be cautious. Side effects can include mild stinging, itching and skin rash. You can also check out our post on how to do a DIY pedicure if you need some more direction! What is the best cream over the counter? 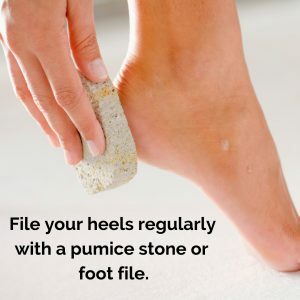 Do you ever wonder What causes cracked heels? or How paraffin helps cracked heels?